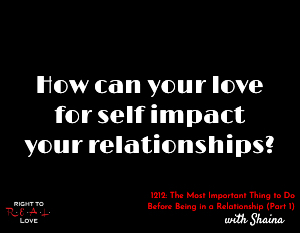 In this episode, Yahnathan is joined by Shaina of the Sisterly Love Podcast to address the question: How can your love for self impact your relationships? How can your love for self impact your relationships? Why it’s important to love yourself before getting into a relationship. The value in spending time alone. Shaina shares how loving herself helped prepare her for marriage.